Warm edge – the difference in energy loss is not worth mentioning!?? Good gracious! Maybe this was valid in former times, when thermal transmission coefficients of windows were on rather humble level. For window U-values of more than 2 W/m²K, the improvement by use of warm edge systems was not that much. During the past years though, windows went through an enormous evolution in thermal performance. Nowadays, Uw-values of windows for new buildings in Germany are in the range of approx. 1.1 to 0.8 W/m²K, and this Uw-value is for the whole window, including frame and thermal bridge at the glass edge – not only a center-of-glass value. By rule of thumb, the use of warm edge instead of conventional aluminium or steel spacers improves the Uw-value of wooden- or PVC windows by approx. 0.1 W/m²K – or for metallic windows up to 0.2 W/m²K. Considering that approximately reveals that the effect of warm edge is easily in the range of 10 % – of the overall energy losses through a window, note well! But for all that, in new windows aluminium spacers still do occur, even if it is triple glazing. What a pity, to pass up the chance for improving the Uw-value. Why? Is it just a lack of knowledge or making false economies? After years of educational work on this area I have no more understanding for that. Compared to other measures for thermal optimization of windows, warm edge is simple to implement and in addition extremely economical. Once the new windows are installed without warm edge, they will stay like that for the next decades. The potential for energy saving is lost for a long time. 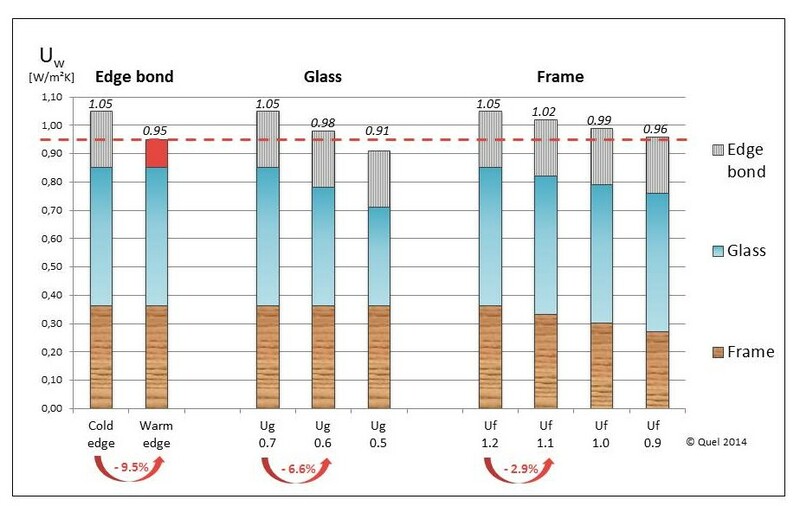 This graph shows the energy losses of a single-winged window and how they are shared between the three window components glass, frame and edge bond. Furthermore it illustrates the potential for optimization. Starting point is a window with the dimension 1.23 m x 1.48 m, a frame share in the total window area of 30 %, an Uf-value of 1.2 W/m²K and triple glazing with an Ug-value of 0.7 W/m²K and edge bond with aluminium spacers. GFF-magazine of march 2014 here .